Join us on this on this amazing combination of Greek Odyssey, Jewish Heritage staying in 5* hotels with choice of extended trip to the beautiful Halkidiki coast for rest and relaxation. If you have trouble downloading booking form you can download same from the left hand margin of our website www.jewishheritagetours.co.uk or call me and I will take all the details I need from you and take your deposit by credit card. The trip is already confirmed with over 20 bookings so you can proceed to book the RyanAir flights from Stansted…with programme as follows…. Our tour will discover the architectural gems of ancient Greece and facets of the 2,300-year Jewish existence within Greek culture. 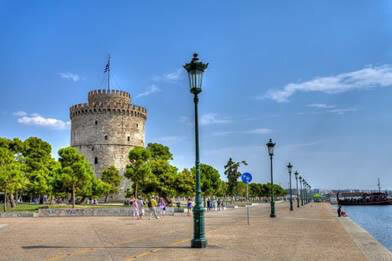 The tour begins in Thessaloniki, a port that is not usually on the tourist map but which visitors find fascinating. The city was once 75% Jewish. The tour continues through beautiful scenery, stopping to see the wonderfully preserved tombs of Alexander the Great’s family in Vergina, Synagogue and Jewish quarter in Veria, before we exit the city on Monday allowing those who want to opt to extend trip to the beautiful peninsular of Halkidiki for rest and relaxation. Thursday 12th September Arrival at 10pm (Ryan Air leaving 4.55pm from Stansted) at Thessaloniki airport where we meet with guide Rania who on the way to our hotel gives an overview of the city and its Jewish history. We check in to the Hotel 5* Electra Palace and Boutique Daios on Harbour walk, The Electra Palace is in central position in the heart of the main square opposite the sea. Awash with smart cafes bars, very good restaurants surrounding hotel open late if you wish to eat. Friday 13th September In the morning Hella leads a Jewish walking tour, visiting the Square of Jewish Martyrs and the ceremonial Synagogue Lezikaron followed by a presentation at the Jewish Museum where we learn about a community that once had 50 synagogues and was called Mother of Israel, home to famous Jewish mystics, legalists, poets and rabbis. Our coach takes us to various quarters of the city that were once wholly Jewish and to archaeological sites going back to Roman and Hellenic times, villas once inhabited by prominent Jewish residents and the new Holocaust Memorial on the site of the cemetery destroyed by the Nazis, now the Aristotle University campus. We return to our hotel in time to freshen up and, for those who wish, to walk to the Monastiriot Synagogue for Shabbat prayers. Then we enjoy a Shabbat kosher meal, hosted by the entertaining Rabbi Joel Kaplan at the nearby Astoria Hotel. Those of you requiring kosher lunch on Shabbat at the Astoria Hotel need to pre-book with us. Sunday 15th September 9.00am We head by coach for the day first to Vergina where the unearthing in 1977 of the richly extravagant tombs of King Phillip 11, father of Alexander the Great, became as famous as the Dead Sea Scrolls. We continue to Veria where we hear about the town’s rich Christian heritage but mainly absorb its Jewish quarter with its unique setting and the atmosphere that still prevails at the natural river mikva. Excludes flights and travel Insurance which is vital. Deposit per person of £175 required to secure booking.